It can sometimes seem like history is dominated by famous, distant figures: generals, politicians, scientists, and the like. On occasion we hear of what life was like for the average commoner. But the opportunity to learn about the lives and stories of real people from our own area is truly rare. 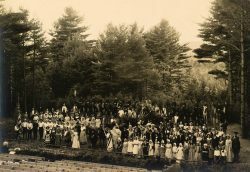 Although you won’t find mention of them in any textbook, the Scott family, whose members lived in and around the town of Peterborough at the outbreak of the Revolutionary War, has an impressive record. Twelve men from this family served in the Revolution in some capacity; some for only a few months, some for the duration of the war. The Scott family’s activities warranted an entire section in Peterborough New Hampshire in the American Revolution by Jonathan Smith, a book which provides impressively detailed records of Peterborough’s role in the Revolution. As oddly specific and dense as the book may sound, it is a testament to how even the smallest town’s history may have some great stories to tell. All the following events were recorded in that book. It’s impossible to cover the careers of all twelve Scotts, but two men had particularly interesting adventures. These cousins were both annoyingly called William, but mercifully held different ranks during the war. They have very different stories. Born in 1744, William Scott (who would later be a major) arrived in America in 1760 from Ireland. His cousin, William, who would be later known as Captain Scott, was born in America in 1742. When the Revolution began, following the Battles of Lexington and Concord, the two raised a company of men from the Peterborough area (some of whom were other Scotts) and made for Cambridge, Massachusetts. Their company was likely attached to General John Stark’s New Hampshire regiment when they fought in the battle of Bunker Hill. It is here that their paths diverge. Captain Scott and Lieutenant Scott appear on Peterborough’s roll of Revolutionary soldiers. Captain Scott was wounded in the knee during the fighting, but remained with his soldiers until he was captured. The British shipped him to be imprisoned in Halifax, but he and six comrades managed to escape with the help of a friend. He sailed back to Boston where he immediately joined the American army, being assigned, with his company, to Henry Jackson’s Massachusetts regiment. However, he was captured again at the Battle of Fort Washington, but again managed to escape captivity. Returning once again to the Army, he was commissioned by General Washington in 1777 to form a company of rangers for a different regiment. In 1781 he resigned from the army and joined the fledgling American navy, serving on a frigate called the Duane. He left service in 1782, the war ended in 1783, and he eventually came to settle in New York before being appointed a storekeeper at West Point. Major Scott, on the other hand, survived the Battle of Bunker Hill and remained, with his original company, in the 1st New Hampshire Regiment. They served at Fort Ticonderoga for a time before it was abandoned. He was later present at the Battle of Bemis Heights in 1777, where he was shot in the hand during the fighting. Despite its complete loss of functionality, he continued to serve. Fighting at the Battle of Monmouth in 1778, he received a bayonet wound in the back. Again, despite his wound, he fought on. In 1779, he served in an expedition against Native American forces in New York, supposedly defeating a chief during a fight and taking his silver-mounted rifle as a trophy. He finally retired when his regiment was disbanded at the end of the Revolution. Scott served in every battle his regiment had been a part of, and his many subsequent injuries made it difficult for him to work. Despite applying for a pension, he did not receive one until 1807, 24 years after the war’s end. Keep in mind, these are just two of the twelve men of the Scott family who served in the Revolution. John Scott, Major Scott’s son, for instance, served with his father as a battlefield musician. 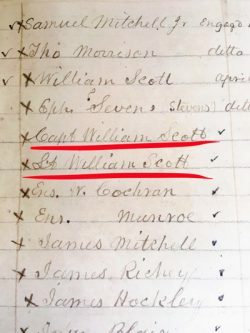 David Scott, Captain Scott’s son, served for nearly the entire war before succumbing to disease in 1782; he was remarkably the only member of the family to die in the war. Through all the dusty tomes and archaic language of historical records and books, there are genuinely interesting stories to be found. What’s more remarkable is that they are about people from Peterborough, New Hampshire, of all places. Whenever it seems like small, rural towns have nothing special to offer the world, just dig a little bit into their history. You might find something more interesting and closer to home than any general, politician, or scientist.